Go to the cookie aisle at your local grocery store and take a peek at the ingredient list on the packages of cookies. Without a doubt, you will find ingredients in there that you can’t even pronounce. Yet, we have no qualms about eating these types of cookies and I know I really haven’t given it much thought. 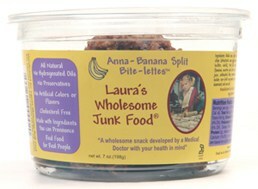 However, I have seen the light of day after trying out some Laura’s Wholesome Junk Food’s Bite-lettes. They taste INCREDIBLE!!! What is different about these sweet treats is that they are made with REAL FOOD INGREDIENTS that you can easily identify like rolled oats, raisins, chocolate chips, bananas, dates, coconut and flour. These bite-lettes are cross between a cookie and protein bar and sooooooo yummy! 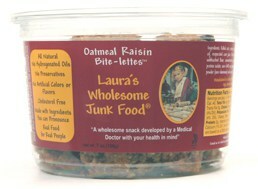 Laura’s Wholesome Junk Food is a step above the competition in my opinion with these all natural cookies. They are cholesterol free and have no trans fats or artificial flavours/preservatives/colours. In short, they are almost like eating a homemade cookie you made yourself! Laura’s Wholesome Junk Food sent me six varieties of Bite-lettes to try in the following flavours: Xtreme Chocolate Fudge, Cole’s Cashew Chocolate Chip, Anna-Banana Split, Mint Double Fudge, Oatmeal Raisin, and Oatmeal Chocolate Chip. Wow…I was HOOKED on the first bite! We finished off all six tubs and I have been craving more ever since. If I had to pick a favourite, I would say it is the Oatmeal Raisin hands down. They look little balls kind of like a cookie would look before you put them into the oven. They were sooooo moist and chewy and just downright amazing! The raisins were plump and juicy and the cinnamon flavours just melt in your mouth. I tried to stop at one or two, but I couldn’t. I did save a few for John and he loved them too. John selected two favourites: Anna-Banana Split and Oatmeal Chocolate Chip. The Banana tastes like you are eating a Banana Split and has an awesome flavour. The Oatmeal Chocolate Chip is a real treat for people who can’t decide whether to eat a chocolate cookie or an oatmeal cookie. They are the most popular product of all the bite-lettes. Â The chocolate cookies were also awesome and perfect for a chocoholic to satisfy that sweet tooth. Yum! Its a nice change to eat a healthy treat that doesn’t have that distinctly “healthy” taste. I have tried other “good for you” products and they always tasted a bit off. I didn’t find that at all with Laura’s Wholesome Junk Food. These are phenomenal cookies and ones that I would LOVE to have around in my house all the time. Don’t miss out on these yummy treats!